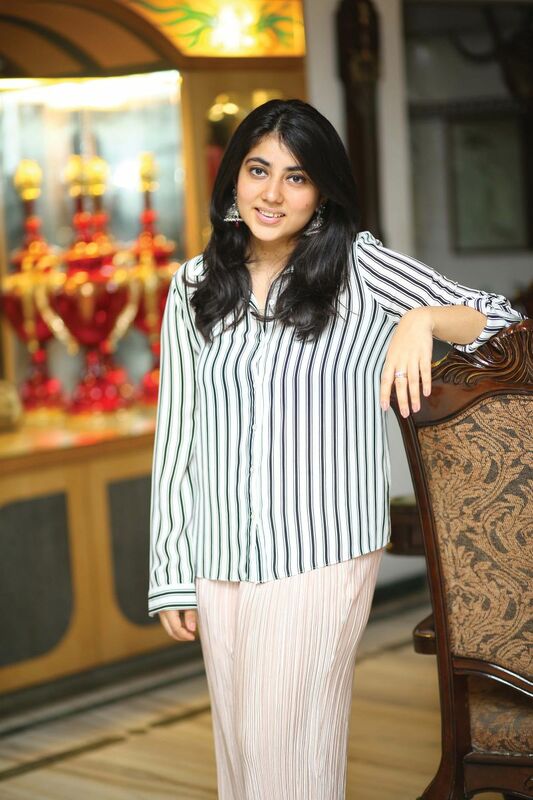 She’s just completed her third year of college at NIFT, but she’s already got a thriving business running. Raashika Bammi started her eponymous fashion label a year ago, and within this period she’s been quick to win some trusted clients. 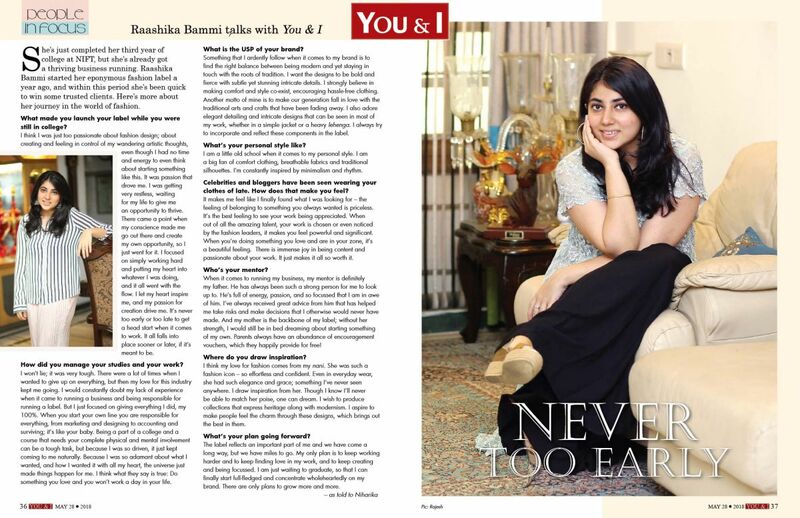 Here’s more about her journey in the world of fashion. What made you launch your label while you were still in college? I think I was just too passionate about fashion design; about creating and feeling in control of my wandering artistic thoughts, even though I had no time and energy to even think about starting something like this. It was passion that drove me. I was getting very restless, waiting for my life to give me an opportunity to thrive. There came a point when my conscience made me go out there and create my own opportunity, so I just went for it. I focused on simply working hard and putting my heart into whatever I was doing, and it all went with the flow. I let my heart inspire me, and my passion for creation drive me. It’s never too early or too late to get a head start when it comes to work. It all falls into place sooner or later, if it’s meant to be. How did you manage your studies and your work? I won’t lie; it was very tough. There were a lot of times when I wanted to give up on everything, but then my love for this industry kept me going. I would constantly doubt my lack of experience when it came to running a business and being responsible for running a label. But I just focused on giving everything I did, my 100%. When you start your own line you are responsible for everything, from marketing and designing to accounting and surviving; it’s like your baby. Being a part of a college and a course that needs your complete physical and mental involvement can be a tough task, but because I was so driven, it just kept coming to me naturally. Because I was so adamant about what I wanted, and how I wanted it with all my heart, the universe just made things happen for me. I think what they say is true: Do something you love and you won’t work a day in your life. Something that I ardently follow when it comes to my brand is to find the right balance between being modern and yet staying in touch with the roots of tradition. I want the designs to be bold and fierce with subtle yet stunning intricate details. I strongly believe in making comfort and style co-exist, encouraging hassle-free clothing. Another motto of mine is to make our generation fall in love with the traditional arts and crafts that have been fading away. I also adore elegant detailing and intricate designs that can be seen in most of my work, whether in a simple jacket or a heavy lehenga. I always try to incorporate and reflect these components in the label. I am a little old school when it comes to my personal style. I am a big fan of comfort clothing, breathable fabrics and traditional silhouettes. I’m constantly inspired by minimalism and rhythm. Celebrities and bloggers have been seen wearing your clothes of late. How does that make you feel? It makes me feel like I finally found what I was looking for – the feeling of belonging to something you always wanted is priceless. It’s the best feeling to see your work being appreciated. When out of all the amazing talent, your work is chosen or even noticed by the fashion leaders, it makes you feel powerful and significant. When you’re doing something you love and are in your zone, it’s a beautiful feeling. There is immense joy in being content and passionate about your work. It just makes it all so worth it. When it comes to running my business, my mentor is definitely my father. He has always been such a strong person for me to look up to. He’s full of energy, passion, and so focussed that I am in awe of him. I’ve always received great advice from him that has helped me take risks and make decisions that I otherwise would never have made. And my mother is the backbone of my label; without her strength, I would still be in bed dreaming about starting something of my own. Parents always have an abundance of encouragement vouchers, which they happily provide for free! I think my love for fashion comes from my nani. She was such a fashion icon – so effortless and confident. Even in everyday wear, she had such elegance and grace; something I’ve never seen anywhere. I draw inspiration from her. Though I know I’ll never be able to match her poise, one can dream. I wish to produce collections that express heritage along with modernism. I aspire to make people feel the charm through these designs, which brings out the best in them. What’s your plan going forward? The label reflects an important part of me and we have come a long way, but we have miles to go. My only plan is to keep working harder and to keep finding love in my work, and to keep creating and being focussed. I am just waiting to graduate, so that I can finally start full-fledged and concentrate wholeheartedly on my brand. There are only plans to grow more and more.